This type of junction allows communication between cells. This type is called a gap junction. Small molecules or ions can pass through, as we will see by the following figures. The above freeze-fracture /freeze etch image shows the internal view of the gap junction on the left. The proteins look like little donuts which reflects the fact that they are actually a channel. These proteins are "connexon" molecules. The side facing the cytoplasm (called the P face) is shown in the center panel. The region looks like aggregated lumps. 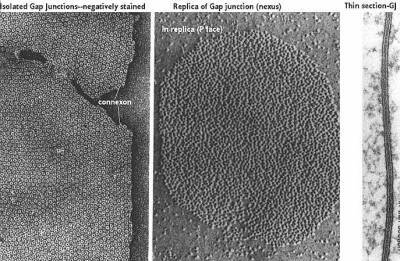 Finally, the typical electron microscopic view is seen in the third panel. 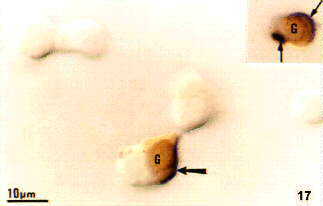 This shows a thin line between the two plasma membranes indicating a "gap junction". This figure was modified from Bloom and Fawcett, A Textbook of Histology, Chapman and Hall, N.Y., Twelfth Edition, 1994, Figure 2-14. 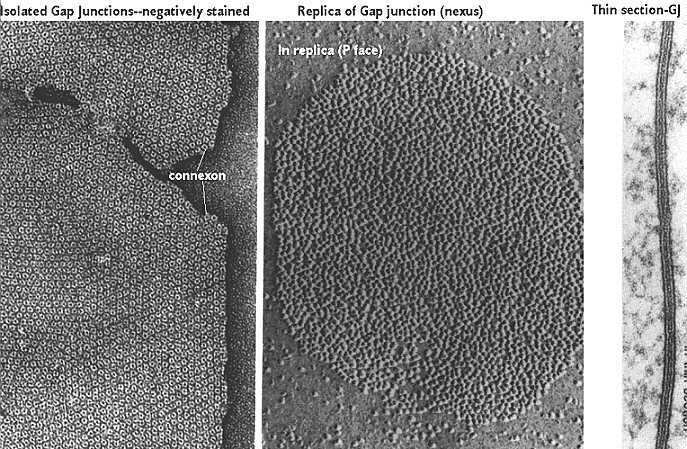 Gap junctions are formed by the dimerization of 6 connexin molecules to form a hemichannel called a "connexon". These are brought to the cell surface as a unit and one hemichannel docks with another hemichannel on an adjacent cell. Alignment of the pore regions allow transport of small molecules from cell to cell. 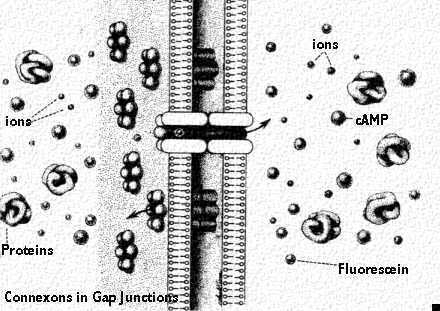 There are several ways to prove the cells are communicating by gap junctions. First, one can identify the connexon molecules by immunocytochemical labeling. Second, one can identify the actual junctional complex with freeze-fracture/freeze etch. To see if they are functional, however, one needs to inject one cell with a dye and watch to see if it is transferred to another cell. This cartoon diagrams a view of a gap junction showing molecules that can freely pass. Ions pass and in this way the cells can be electrically coupled together. Other small molecules that pass through include cyclic AMP (a second messenger) and the dye marker fluorescein. This last compound enables the scientist to study transport through the gap junction. This figure was modified from Bloom and Fawcett, A Textbook of Histology, Chapman and Hall, N.Y., Twelfth Edition, 1994, Figure 2-15. Receptors are a special class of transmembrane protein that can be detected by their ligand. They have the reactive group projecting from the surface that binds a specific ligand. This cartoon shows the interaction between the ligand secreted by one cell (such as a hormone) and its receptor. 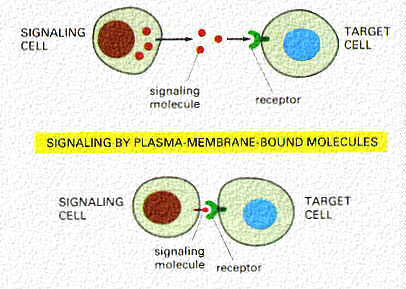 The lower cartoon shows interactions between two cells, one with a receptor for a protein on the surface of the other cell. This kind of reaction may occur when natural killer cells recognize a foreign cell. What do you expect to happen if the cell is cooled to 4 C? The figure above shows how a receptor-ligand complex can be detected at the light microscopic level. The ligand is attached to biotin and then it binds the target cell. It is detected by an avidin peroxidase conjugate which is visualized by a reaction for the enzyme peroxidase. This protocol is called "affinity cytochemistry". In this figure, the biotinylated ligand is labeled black (note that it is capping on one of the cells). The orange label defines the protein in the cell by immunocytochemistry. [/url] for a seem and you can examine it for youreslf.